On April 6, 2015, James Brown was appointed by Mayor Jim Gray to fill the unexpired term of Chris Ford, who resigned to serve as the city’s Commissioner of Social Services. During a special election in November 2015, James was officially elected to the position of 1st District Councilmember. A native of Lexington, Ky., James is a graduate of Paul Laurence Dunbar High School. James’ previous employment include stints at Lexmark and GTE, before beginning a career in the automotive industry, working for 13 years at the Toyota Motor Manufacturing plant in Georgetown, Ky. After that, James made a career change becoming a full-time real estate professional, selling both residential and commercial property for United Real Estate. James is extremely passionate about service to neighborhoods and the local school system. He has served as the President of the Radcliffe–Marlboro Neighborhood Association and helped initiate several neighborhood programs. 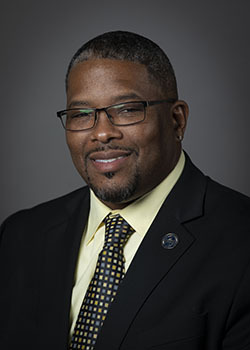 He serves as the First Vice President of the 16th District PTA and he has participated in the Fayette County Public Schools superintendent search process and the 2015 Rezoning Committee. In the business community, James has participated in multiple community leadership programs, such as: Commerce Lexington’s Leadership Central Kentucky (2011), BCTC’s Citizens’ Leadership Academy (2012) and is a Certified Tourism Ambassador through the Lexington Visitors Center. James and his wife, Charmayne, have three children. Purpose – To identify ways to protect vulnerable residents from the consequences of neighborhood redevelopment and transformation, with an emphasis on preserving history and the culture of communities. The first district boundaries includes portions of downtown Lexington north of Main Street including, the east end neighborhood, parts of the west end and as far north as Interstate 75. Some of the major corridors in the District include: Georgetown Street, Newtown Pike, Russell Cave Road, N. Limestone, N. Broadway and Midland Avenue. The district is made up of over 15 neighborhood parks and community centers including two parks that are over 100 years old, Duncan Park and Douglass Park. Many of the District’s downtown neighborhoods are on the National Register of Historic Places such as homes on Constitution Street, Elsmere Park and in Gratz Park. Most recently, the legendary Lyric Theatre & Cultural Arts Center was renovated and reopened in 2010, as well as the Charles Young Community Center and park in 2012. The district has completed two small area plans for the Central Sector area and the East End neighborhood. The Winburn & Russell Cave Road Neighborhoods Small Area Plan is currently being developed.